A little over a week ago I received an email from a friend of mine that runs a ministry website asking what advice I would give as a pastor to a congregation. That is a wide open subject since I spend a large part of my time studying the Bible and giving people advice based on what is revealed in the Scriptures. It was getting late and I did not want to have to write a long dissertation on a host of subjects, which I don’t think many people looking at the website would pay attention to anyway, so I began to think about what advice could I give that would quickly help people understand the basic principles of successful Christian living. Five things came to mind very quickly which I wrote down and sent off to my friend. The next day I mentioned the request to someone and they asked what I said. I told them, and they thought they were good ideas. I got an email back from my friend who also thought they were good ideas. I then asked some others and they also though they were five good points. As I was preparing in advance for today’s anniversary marking the completion of 21 years of ministry here at Grace Bible Church, I had already been thinking about what I might like to say in keeping with that theme. These five points seemed very appropriate, so this morning I want to share with you some pastoral advice on how to successfully live the Christian life. While there is much more that can and should be said beyond these five points, I do believe that if Christians would purse just these five areas of basic Christian living, then the rest would also fall into place. I believe this would result in not only the people of the church maturing and walking worthy of their calling in the Lord Jesus Christ, but I also believe that the vast majority of problems that occur within the church would also disappear. Let me briefly state these five points to you and then we will come back to examine each point in greater detail. 1) You are a created being who exists to glorify the Creator. 2) You are to be a disciple of the Lord Jesus Christ and not of someone else. 3) You need to feed yourself from God’s word (2 Timothy 2:15). 4) Understand God’s priorities for your life and set your goals accordingly (Romans 12:1-2). 5) Actively use your spiritual gift(s). At one time this would have been accepted as a given, but that was a long time ago. We live in a time and society in which the vast majority of people reject this. While the majority of Americans may still believe that they are created instead of being something evolved from an ape, they do not live according to the ramifications of this truth. They believe their existence is for some purpose other than the glory of their Creator. How do I know that? Simply because people complain and grumble that God is not doing things to their satisfaction instead of being concerned whether they are doing things to God’s satisfaction. Let’s consider a few of the many statements the Scriptures make concerning this point. There was a debate this past Thursday at Orange County Community College on the subject, What is the Origin of Man? God has made it plain throughout the Scriptures that He created man in His own image. All those foolish enough to reject this truth do so in contradiction to the historical and physical evidence, or perhaps I should say in belief of the just-so stories of missing links that remain missing. Artists have done a great job of creating the illusion of such animals from their imaginative illustrations, but the creatures have not existed in the real world. For those who reject man’s origin in God, man is just another animal, and so to be consistent they must also reject all aspects of mankind that separate him from the animals including any concept of morality. 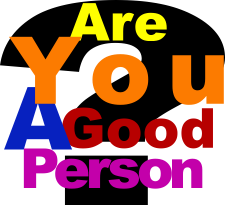 Apart from God there is no basis upon which to distinguish good and evil, right and wrong. There is only the amoral quest to survive and reproduce. In such a world, Hitler was not wrong to start a war and exterminate anyone for any reason, but then, the Allies were not wrong to exterminate him and his followers. The rule of might replaces justice which then continually shifts as new people take the reigns of authority and power only to be replaced by others in the future. People that grumble and complain against God because they are not satisfied with their life demonstrate their blindness to this great truth that they are created beings who are to give glory to their Creator. Their focus is misplaced. This issue is not their satisfaction with the circumstances of their life, but rather, God’s satisfaction with how they live in the midst of their circumstances. Philippians 2:14-15 commands, “Do all things without grumbling or disputing; 15 that you may prove yourselves to be blameless and innocent, children of God above reproach in the midst of a crooked and perverse generation, among whom you appear as lights in the world.” This brings up the next point. A genuine disciple of Jesus will prove himself to be a child of God who appears as a light in the world. The whole idea of being a Christian is directly tied to being a disciple of Jesus Christ. A disciple is simply the follower of a teacher, and when a disciple is fully trained, he will be like his teacher (Luke 6:40). Disciples of Jesus seek to follow His teachings and become like Him. Acts 11:26 states that “the disciples were first called Christians in Antioch.” The term “Christian” means to be a “little Christ,” and it was first used in Antioch by the Gentiles as a derogatory name for the followers of Jesus. The disciples took it as a badge of honor and began using it for themselves, but prior to this, believers in Jesus were most often simply called disciples. Jesus explained in Matthew 28:19-20 that the primary task of the church is to make disciples, “Go therefore and make disciples of all the nations, baptizing them in the name of the Father and the Son and the Holy Spirit, 20 teaching them to observe all that I commanded you; and lo, I am with you always, even to the end of the age.” We make disciples of Jesus by going out and proclaiming the gospel to the unbelieving. Those that respond in repentance of their sins and place their faith in Jesus are baptized as a sign of their identification with Jesus’ death, burial and resurrection. They have been born again and so have died to their old life and have been raised to newness of life in Christ (Romans 6). The Christian then seeks to learn all that the Lord has commanded so that he can be obedient to God. That is the reason we are so serious about Bible study. We want to know what God has revealed about Himself and His will so that we can know Him and be careful to walk with Him in a worthy manner. This misunderstanding of what a Christian actually is has resulted in multitudes of people professing to be Christians without being His disciples. Their claim may be done in ignorance, but it is still false. There are plenty of religious people that believe and teach that Jesus was a good man, an ethical teacher, the supreme example of love or the founder of a great religion. But if that is all they believe about Jesus, then they have the wrong Jesus and they are left in their sins. You must have the right Jesus and be His followers. Jesus is God in human flesh. He lived a sinless life and then willingly died as the substitute sacrifice that atoned for sin. He rose from the dead on the third day proving His promises to be true including His offer of forgiveness of sin and eternal life to all who believe in Him. He has ascended to the right hand of God the Father in heaven and one day He will return to take His disciples to be with Him forevermore. You must be a follower of the Lord Jesus Christ and you must also be careful that you are not led astray from Him by anyone else. That includes those who claim to be Christian teachers and pastors. Paul said in 1 Corinthians 11:1, “Be imitators of me, just as I also am of Christ.” In the process of discipleship, now also often referred to as mentoring, the disciple will gain the skills and characteristics of the teacher. When this is done properly in Biblical Christianity, both the student and the mentor will increase in Christ likeness. But there is also a danger because the mentor, the teacher, could also seek to draw the disciple away after himself instead of pointing them to Christ. Paul warned in Acts 20:28-30 to be on guard against this for there would be those within the church that would arise to do this. This danger is why I am always challenging you to be like the Bereans and check out what I say against the Scriptures. Don’t believe what I say because I am the pastor of this church. Believe it because it matches what God says in His word. If it does not, then correct me. In the same vein, do not imitate my example because I am the pastor of this church. Follow my example because it is consistent with Christ’s example of life, and anytime I stray from that, then correct me. Imitate me as I imitate Christ, and I will do the same in regards to you. We grow into Christ likeness together while recognizing that each will stumble along the way and need help to get back up and keep walking. Let me take this one step further. Paul had to correct the Corinthians because factions had developed in that church over whom the people were following. Some claiming they were of Paul, others of Apollos and others of Cephas as if Christ was divided. There will be many people past and present that God will use in your life to help you be a disciple of the Lord Jesus, make sure it stays that way. Do not become a follower of men no matter how wonderful they may seem to you. For example, my biggest problem with Calvinists is their identification of themselves in that manner. Where John Calvin was true to Scripture and his writings are helpful, then praise God, but keep your eyes on Christ. Where he was wrong, then don’t follow him, but praise God for others that have helped you understand and apply the Scriptures properly, and keep your eyes on Christ. Make sure are a disciple of Jesus Christ and not of someone else. Follow other people only to the extent that they are following Christ. Knowing the Bible is also critical if we are going to help one another in walking with God. Paul goes on in 2 Timothy 3:16-17 to state, “All Scripture is inspired by God and profitable for teaching, for reproof, for correction, for training in righteousness; that the man of God may be adequate, equipped for every good work.” The word of God is the means by which I learn to walk on the path of righteousness, am reproved to know that I have gotten off that path, am corrected as to how to get back on it, and then instructed on how to stay on it and not stray in the future. o the Christian walk. That is not to say there are not some good things available too, but without a good knowledge of God’s word, there will not be discernment to know what is good and what is bad. If you think your schedule makes it too difficult to read and study the Bible for yourself and pray, then do the following. First, find ways to free up time. This will require taking a hard look at your activities and eliminate anything that is detrimental. You may also have to eliminate anything that is not helpful. It could even be a good thing, but if it is not helping you go where you need to go, then set it aside. Second, look for ways you can use your time more effectively. This will include increasing your efficiency and being innovative to use your time more wisely. We live in an amazing time when you can get audio Bibles in many formats. Listen while you drive, exercise or do the dishes. Let the word of God clean your mind while you clean the house. (I recommend the NKJV Word of Promise audio Bible). Listen to recordings of sermons and teachings so that you are continually challenged to know God and walk with Him. If you do not do these things, then do not be surprised when you receive the same kind of rebuke Paul had to give the Corinthians – “And I, brethren, could not speak to you as to spiritual men, but as to men of flesh, as to babes in Christ. 2 I gave you milk to drink, not solid food; for you were not yet able [to receive it.] Indeed, even now you are not yet able, 3 for you are still fleshly. For since there is jealousy and strife among you, are you not fleshly, and are you not walking like mere men?” (1 Corinthians 3:1-3). Your walk with the Lord Jesus Christ is not a game or a hobby, it is life. If you are not serious about it already, then it is time to get serious. There is nothing more tragic than wasting the life that God grants to you. This brings up my next point about priorities. I do not believe that most professing Christians purposely set out to ignore personal Bible study. I think it is more often a failure in understanding God’s priorities in life, which in turn usually stems from not understanding and placing importance on being a true disciple of the Lord Jesus Christ, and this often goes back to a failure to recognize and understand that all of us are created by God for His purposes and glory and not our own. The basis for Paul’s commands here are the mercies of God. That points back to all that God has done in the Lord Jesus Christ in redeeming man from sin and adopting believers into His family. Because of that, it is only reasonable that Christians live their lives as holy sacrifices acceptable to God. That means you have died to self and now are to live for God. Paul expresses this idea clearly in Galatians 2:20 saying, “I have been crucified with Christ; and it is no longer I who live, but Christ lives in me; and the [life] which I now live in the flesh I live by faith in the Son of God, who loved me, and delivered Himself up for me.” Jesus said in John 4:34, “My food is to do the will of Him who sent Me, and to accomplish His work.” Do you view your life the same way Jesus and Paul did? Paul goes on to address the very practical side of Christian living. The world places a lot of pressure on you to live like everyone else. You have to resist that pressure and instead live as the radically different new creation that you are in Jesus Christ (2 Corinthians 5:17). This change of lifestyle will take place as your mind is renewed by the Holy Spirit through the word of God. All of your priorities in life are changed because of this. Your first priority is the pursuit of the purpose of your salvation in Jesus Christ in living in righteousness for the glory of God. Ephesians 1:4 states that God “chose us in Him before the foundation of the world, that we should be holy and blameless before Him.” The good news is that according to Philippians 1:6, this good work God began in us He will continue to perfect in us until the day Jesus returns. At that time, God will complete that work and we will be conformed into the image of His son (Romans 8:29). We shall be like Him (1 John 3:2). This priority of living in righteousness for God’s glory makes us radically different from the world. The world puts priority on wealth, fame and power. The Christian places the priority on dependence, humility and service. The world values wealth while Matthew 6:33 explains the priority of the believer, “But seek first His kingdom and His righteousness; and all these things shall be added to you.” We trust God to provide for our needs according to His promises so that we can focus on glorifying Him. For that reason the follower of Christ learns to be content in all circumstances even as Paul explains in Philippians 4:10-13. As 1 Timothy 6:8-9 explains, the Christian can be content with just food and covering and so avoids the temptations and snares of those who seek riches. The world places a priority in gaining fame while the disciple of Jesus places the priority on God’s fame. For that reason the Christian will humble himself before God and let Him take care of any fame that may be given (1 Peter 5:6). The believer follows Jesus’ command in Matthew 5:16 to “Let your light shine before men in such a way that they may see your good works , and glorify your Father who is in heaven.” God’s glory, not their own is what is important. Christians also have different priorities in their home life. Each strives to fulfill the role that God has placed upon them (See Ephesians 5:21-6:4; Colossians 3:18-25; 1 Peter 3:1-7). A Christian husband strives to love his wife as Christ loved the church sacrificially seeking her purity and care. He will cherish her while living with her in an understanding way and grant her honor as a fellow heir of the grace of life. A Christian wife will humbly follow her husband’s lead and show him respect. Even if he is disobedient to the word, she will strive to win him by her chaste and respectful behavior. Christian parents will raise their children in the nurture and admonition of the Lord, not popular psychology. They know their primary role is to teach their children about God and how to walk with Him (Deuteronomy 6:4-9). Children of believers learn to obey their parents so that they will learn obedience to God, for that is the key for a life that goes well. Christians will also work diligently so that they will have something to share with those who have need (Ephesians 4:28). This brings up their willing service to their community. They will actively demonstrate God’s love to their neighbors. This is first expressed within the household of faith, but it then extends to all people (Galatians 6:10). This brings up my last point. I have spoken on this subject many times, so I only want to quickly remind you that God has gifted every believer as a member of the body of Christ, the church, to serve Him and one another. Romans 12:3-8, Ephesians 4:11-16 and 1 Corinthians 12-14 all address this issue. If you are a disciple of the Lord Jesus Christ, God has given you some spiritual gift by which you are to glorify Him. He will enable you as He wills to use that gift in some ministry at some level of power so that the rest of the church is built up and moved to greater maturity. As 1 Corinthians 12:7 puts it, “But to each one is given the manifestation of the Spirit for the common good.” No gift, ministry or ability is for the purpose of self-edification. This means that you are important to the health of the rest of the body for without you the rest of us are left handicapped. We will not mature or be able to serve the Lord as we should, and neither will you. According to Ephesians 4:11-12, my role as a pastor-teacher is to help equip you “for the work of service, to the building up of the body of Christ.” Ephesians 4:13-16 continues on to describe the working of the whole church together “until we all attain to the unity of the faith, and of the knowledge of the Son of God, to a mature man, to the measure of the stature which belongs to the fullness of Christ.” That joint maturity enables everyone to stand firm against heresy, false teachings and schemers that would lead us astray because each individual part works together to help all the other parts causing “the growth of the body for the building up of itself in love.” Every Christian is in need of the rest of the church. As I complete 21 years of ministry here at Grace Bible Church, my goals have remained the same throughout all the years and all of it reduces down to these five points and then replicating it in the communities around us. I can do my part, but it takes all of us working together to succeed in seeing this church mature in spiritual health and size so that we can plant churches in the surrounding communities and see them do the same. I still believe that can and will happen if all who are Christians here will take to heart and live by these five points. 1) You are a created being who exists to glorify the Creator. Do not grumble and complain that God is not giving you the life you want, your concern needs to be living your life in a manner that satisfies Him. 2) You are to be a disciple of the Lord Jesus Christ and not of someone else. The goal is to become like Jesus, do not let anything else sidetrack you from that quest. 3) You need to feed yourself from God’s word. The ladies’ Bible study that starts this Tuesday at 7 pm can help you do that. 4) Understand God’s priorities for your life and set your goals accordingly. Live in righteousness to the glory of God. Walk humbly in trust of God seeking to serve others. Fulfill your God given role in your family. Serve others in the church and community. 5) Be active in using your spiritual gift(s). Do not cripple yourself and leave the rest of the body handicapped. Be involved, serve and help the rest of the church mature. Parents, you are responsible to apply God’s Word to your children’s lives. Here is some help. Young Children – draw a picture about something you hear during the sermon. Explain your picture(s) to your parents at lunch. Older Children – Do one or more of the following: 1) Write down all the Scripture references made. 2) Count how many times the words “disciple” and “Christian” are used. Talk with your parents about each of the five points and how you can fulfill them. Questions to consider in discussing the sermon with others. What advice would you give to other Christians that would enable them to live the Christian life successfully? How do we know that God created man? Why is that important? What is the basis for morality? What is the purpose of man’s existence? Explain. Why is it evil to grumble and complain? Why is it more important to satisfy God than satisfy self? Explain. What is a disciple? What is the relationship between being a Christian and being a disciple of Jesus? How does this differ from the common understanding of what it means to be a Christian? What three tasks must the Church fulfill to carry out its commission to make disciples of Jesus? What must a person believe about Jesus in order to be saved from sin? What is the proper role of being a disciple of other people in becoming a disciple of Jesus? What danger is there in being the disciple of other people? How is that danger avoided? Why must a Christian be diligent to know the word of God and pray? What are the benefits of being a good Bible student? What are the dangers of being ignorant of the Scriptures? Examine your use of your time – Are there activities which are detrimental to your spiritual walk that should be eliminated? If so, when will you eliminate them? Are you keeping the proper priorities in the activities that you do? Are there things that may be good, but are not helpful, that should be set aside? Are you using your time effectively? Are their ways you can be more efficient? Are their activities in which you can include listening to an audio Bible, sermons, teachings? What are the priorities God has for your life in each of the following areas: Purpose of your existence? Purpose of your salvation? Wealth? Fame? Power? Home life? Employment? Church? Community? Are you keeping those priorities? What is the origin and purposes of spiritual gifts? What is the purpose of the pastor-teacher in a church? What is the importance of every member working together? What happens if they do? What happens if they do not? Are you fulfilling your role in the body? 1) You are a _____________ being who exists to glorify the Creator. 2) You are to be a ___________ of the Lord Jesus Christ and not of someone else. 3) Learn to ___________ yourself from God’s word (2 Timothy 2:15). 4) Understand God’s ______________ for your life and set your goals accordingly (Romans 12:1-2). Walking with the Lord is not a game or a hobby, it is __________- don’t waste it.